Belgium is a country that needs no introduction. It is known worldwide as the home to the European Union headquarters located in Brussels, which is also the de facto capital city of the European Union. As such, Belgium has strong ties with many European and non-European countries including Canada. 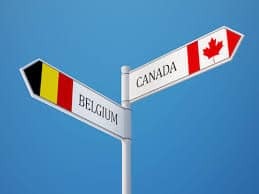 Since both contain significant Francophone populations, Belgium draws the interest of many Canadians, offering a comfortable European lifestyle and in some cases an ideal location to pursue corporate opportunities. Naturally, long term endeavors in Belgium require some supporting documentation such as birth certificates, marriage certificates, passport copies, certificates of incorporation, corporate power of attorneys, and certificates of pharmaceutical products. However, these documents cannot simply be sent off to Belgium; the authorities may not recognize them and will not be able to tell if they are real. Therefore, they must go through a process that makes them valid for use in Belgium. One of the common processes for doing this is the apostille and it is possible you have been instructed to get a Canadian apostille on your documents for use in Belgium. What many people do not know is that Canada has not signed the Hague apostille convention like Belgium and many other countries. As such, it uses the original process that these countries used before signing the apostille convention. This process is known as authentication and legalization and it is equal to an apostille. If you have Canadian documents that need to be used in Belgium or elsewhere in the world, you will have to go through this process. How do you get your Canadian document authenticated and legalized for use in Belgium? Let’s find out. To make your Canadian documents valid for use in Belgium they first need to contain the signature of an authorized individual. This is required for authentication at Global Affairs Canada, since the very process of authentication involves authenticating the signature of this authorized individual. These signatures can be from Canadian lawyers or notary publics, from select staff at the RCMP, certain court officials, and even the signatories at Canadian provincial vital statistics offices. Once you have this along with the other requirements of Global Affairs Canada, your Canadian document can be authenticated. Unfortunately, this process can take as long as 20 business days for documents they receive by mail or courier and this does not include the actual shipping time to and from Global Affairs Canada. Upon completion of authentication, your documents are ready for the second step of legalization at the consular section of the Belgian embassy in Montreal. There is a Embassy of Belgium in Ottawa as well but they do not provide legalization of Canadian documents for the time being. They also have their own requirements as well as fees and processing times that change frequently. This makes legalization the most difficult step in making your documents valid for use in Belgium. Taken together, authentication and legalization of your Canadian documents can take over a month. Delays are common which adds to the stress as foreign affairs often have strict deadlines that need to be met. We saw the need for a service to expedite this process, relieve stress, and save money in the long run. That’s why we exist. Authentication Legalization Services Canada; as our name suggests, we specialize in the authentication and legalization of Canadian documents for use abroad. We became the first company in our industry when we opened our doors 25 years ago and since then we have made tens of thousands of Canadian documents valid for global use in over 100 countries. We have worked with professional individuals, law firms, famous actors, pharmaceutical companies, and even former Canadian prime ministers process their RCMP police checks, birth certificates, divorce certificates, board resolutions, affidavits, certificates of incorporation, and international trade certificates for use in a foreign country. We developed a process that has become the industry standard and allow you to save up to 20 business days of processing time with authentication service speeds. That is our priority same day authentication service; your documents are authenticated the same day they arrive in our office. We also offer a standard 3 business day and economy 10 business day service which combine affordability with speed. In every case you save time, minimize delay, and most importantly ensure your documents will be properly authenticated and legalized for use abroad. That’s our service guarantee. When you become our client our experts help you prepare your documents and put together your requirements for authentication and legalization. Once we have received your documents we personally present them to Global Affairs Canada for authentication and then the Belgian consulate in Montreal for legalization. You will receive detailed updates at every step of the way. Although we cannot influence the processing time of foreign embassies, the strong professional relationships we have built with their staff over two decades allows us to be up to date on their changing fees and requirements, sometimes even before they are implemented. They know we are always organized and prepare our documents exactly to their specifications which often makes us their preferred clients and by extension, you. After your documents have been successfully legalized your documents are not valid for use in Belgium and can be sent anywhere in the world they need to go with one of our many shipping partners. If you have Canadian documents that you need to use in Belgium, contact us. Feel free to continue reading if you want to learn more about Canadian documents and how to use them in Belgium. Canadian vital statistics documents such as birth certificates, marriage certificates, and death certificates are some of the most commonly used Canadian documents for international affairs. These are usually requested for purposes relating to citizenship, marriage, divorce, or inheritance of an estate in Belgium. These are issued by the provincial vital statistics office of the province wherein the life event occurred. Another document which is occasionally required along with Canadian vital statistics documents is a divorce certificate. Unlike Canadian birth certificates, marriage certificates, and death certificates, divorce certificates are not issued by the provincial vital statistics department but are instead issued by the court where the divorce was finalized. Canadian birth certificates, marriage certificates, and death certificates all contain signatures which are on file at Global Affairs Canada which makes them ready for authentication when they are issued. Note that marriage certificates issued by the church and death certificates issued by the funeral home cannot be authenticated by Global Affairs Canada even if they have been notarized. Conversely, divorce certificates require the stamp seal and signature of a valid court official or clerk from the issuing courthouse. If you already have your divorce certificate, it is very important that you check that the name of the signatory at the court is legible and that the stamp, seal, and signature all match. This is one of the common causes of delay since Global Affairs Canada will not be able to authenticate your divorce certificate if they cannot identify the signatory, or if the stamp, seal, and signatures do not match. If you notice that one of these criteria just mentioned has not been met, call the issuing court and request either the name of the signatory or a new divorce certificate if need be. To be clear, neither Canadian vital statistics documents or divorce certificates require notarization by a Canadian lawyer or notary public. Notarized copies can be made of these documents but the Belgian embassy does not accept notarized copies. Furthermore, the Belgian embassy requires long form versions of these documents wherever applicable. For birth certificates, these can be referred to as a copy of an act of birth or a registration of live birth depending on the issuing province. Make sure you have the long form version of your vital statistics documents or they will not be valid for legalization at the Belgian embassy. There is a chance you are having difficulty finding your Canadian vital statistics documents and this is very common. Canadian birth certificates, marriage certificates, and death certificates are seldom used within Canada which makes them prone to damage or loss over time. Thankfully, it is very easy to order a new Canadian vital statistics document from the appropriate provincial vital statistics office. Before you do so, consider having your document sent directly to our office to begin processing your Canadian vital statistics document right away for use in Belgium. 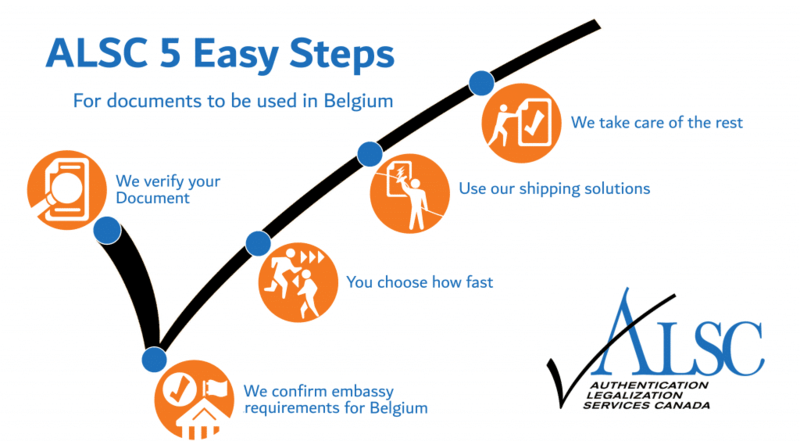 How to use your Canadian Documents in Belgium: Trust ALSC! Getting your documents ready for use in Belgium can seem like an impossible task. Indeed, authentication and legalization can be a very difficult and stressful process. This is especially true if you attempt to do it without assistance. It can sometimes take weeks of planning and preparation to gather the necessary requirements on your own. Since Global Affairs Canada and the Belgian embassy are frequently swamped with others in your position seeking assistance, resolving any errors becomes substantially harder due to a lack of communication. Our agents see documents rejected every day at Global Affairs Canada and various embassies within Ottawa. Many of these people turn to us for assistance realizing there is no way they can meet their deadline on their own. They are surprised when we tell them they can have their documents shipped to Ottawa for free via FedEx when they drop off their documents at one of our service centers in, Surrey, Calgary, Toronto, North York, Mississauga, Halifax, Victoria, Vancouver, Edmonton, Regina, Winnipeg, or Montreal after confirming use of our services. They are also happy to know that our agents are available at all times during our office hours to answer their questions and address their concerns; a benefit which is becoming less common in customer service industries everywhere. They are even happier when they find out that their documents also receive free shipping back to any one of our service centers via FedEx upon completion; their documents properly authenticated and legalized for use in Belgium, guaranteed. Do it right the first time and trust the experts with your Canadian documents for use in Belgium. As our A+ rating with the BBB, proud membership with the Canadian Chamber of Commerce, and our perfect 5-star reviews on Facebook and Google prove, we are the best option every time when making your Canadian documents Global. Click below to get started!